Massage is touch with intent. Using a specific protocol of techniques, pressures, and joint movements massage involves manipulating and stretching all the body’s soft tissues. If you’ve ever had a professional massage – to relax or treat a particular ache – you have firsthand knowledge of the power of touch! 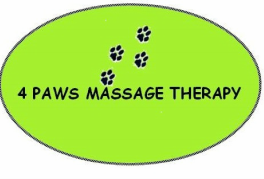 Both humans and animals experience similar physical and emotional benefits from massage such as improved blood circulation and lowered blood pressure, enhanced immune system functioning, reduced inflammation and swelling, relaxed muscle spasms, relieved tension, and enhanced endorphin (the body’s natural pain killers) release which interrupts the pain cycle. Participates in sports or agility events.